호사도요는 매우 희귀한 철새로 서울 부근과 충남 대호, 경남 낙동강에서 확인된 기록이 있다. 2000년 서산 천수만에서 호사도요가 번식하고 있는 것이 최초로 확인된 이후 계속 번식하고 있는 실정이다. 주로 중국, 타이완, 필리핀, 인도네시아, 인도, 아프리카, 일본 전역에 분포되어 있다. 몸길이는 약 24cm 정도이며 긴 부리는 아래로 약간 휘어져 있고 붉은 갈색을 띠며, 끝이 검은색이다. 수컷은 눈주위가 노란색이며, 머리 위와 윗목이 갈색이고, 등쪽은 회갈색에 가느다란 가로 줄이 있다. 암컷은 날개, 허리, 꼬리는 수컷과 비슷하나 수컷보다 색이 약간 짙고 몸이 좀 더 크다. 머리꼭대기는 암 갈색이며 중앙에는 크림색 띠가 있다. 호사도요는 강, 하구, 저수지 등 내륙 습지, 논, 물가의 숲 등에서 서식하며 소택지나 논가의 풀숲에 벼포기를 모아 접시모양의 둥우리를 만든다. The Greater Painted Snipe (Rostratula benghalensis) is a very rare migratory bird sighted in the vicinity of Seoul, Daeho in Chungcheongnam-do, and Nakdonggang River in Gyeongsangnam-do. In 2000, the bird was reported to be breeding in Cheonsuman Bay in Seosan; since then, it has continued to reproduce in Korea. It is found mostly in China, Philippines, Indonesia, India, Africa, and Japan. The bird measures about 24cm and has a long, pointed bill that is slightly hooked at the end. It is a reddish color overall with black tips. The male bird is yellow around the eyes and brown at the top of the head and neck. The back is grey-brown, with thin sideways stripes. The female bird is similar to the male at the wings, trunk, and tail but is slightly darker and larger. The top of the head is dark brown overall and cream-colored in the middle. 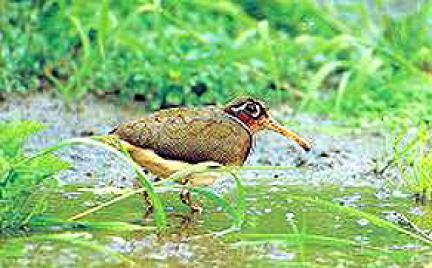 The painted snipe lives in marshy land around rivers, estuaries, and reservoirs as well as rice paddies and waterside forests. It makes a round nest with rice stalks collected from fields and marshlands.